This post shows how to change the default icon for Primefaces tree. From the Primefaces demo, we can see that there are attributes for us to change the opened and closed icon - expandedIcon, collapsedIcon, and also icon. These attributes are not referring to image files. Instead, there are css classes. Thus, we have to define css classes to overwrite the existing. 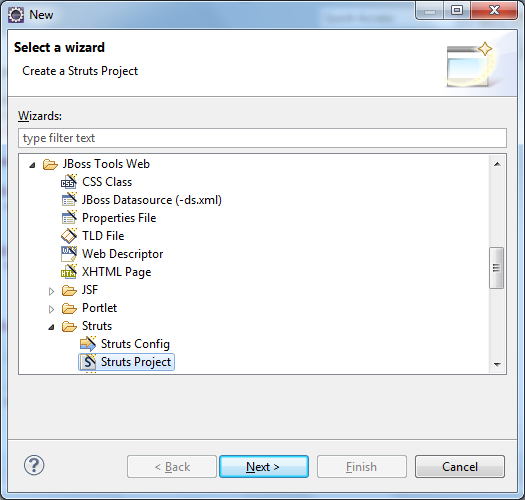 Objective of this post is to show how to create Struts application with JBoss Tools. The main purpose to have dynamic include in <rich:tabPanel /> is save bandwidth and reduce the page size, especially when the tabs having a lots of content. When we deployed SparkWeb as our web IM, group chat is possible with the combination of SparkWeb and OpenFire. Due to the limited features in SparkWeb, users login through SparkWeb are not allowed to create chat room. Thus, we have to create the chat room / conference in OpenFire admin console or Spark IM Client. 2. install SparkWeb as web IM into our web application. In Richfaces, wizard can be created with <rich:togglePanel />, but the disadvantage of this solution is, the component tree would be quite large. Which mean the server needs more memory in order to work well in this situation. and this solution, applicable to Richfaces only. 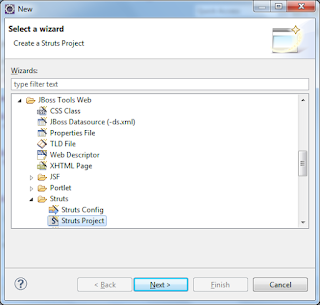 In this post, I will show how to create a wizard application with dynamic include. Thus, the component tree only hold the required page. and this solution is applicable to all JSF implementation. When we embed the SparkWeb in our application, it is very frustrated if users needed to login again to the chat application. but the disadvantage of this solution is user's password is in plain text. Before start this post, you may take a look on How to install SparkWeb in a webapp. Due to certain system requirements, we need to run IM client in browsers. There are many IM clients available over the Internet. This is the list of clients available. Anway, in this post, I will show how to install SparkWeb in a webapp. 1. Download and install OpenFire Server. The chat portlet in Liferay is actually a XMPP client, thus, we can choose to integrate the Chat Portlet with an external XMPP chat server. XMPP Chat Server to be used in this post is OpenFire. Once you have created few composite components for your company/project, probably you are thinking to declare a custom namespace for these composite components. This post will show how to declare a custom namespace. In this post, I will use the previous post - How to package JSF2 composite component as distributable JAR as sample program. The main purpose to package composite component is to share the copy of composite component(s) among other JSF2 project(s). in this post, I will use the jQuery star rating in JSF2 as sample.